World of 2-XL: Mego 2-XL Program "Storyland"
Other Comments: This program has a couple of distinctions; first and foremost, I didn't even know it existed for 25 years! I've never seen it on any official tape lists. When I first came across it I thought it might be a variant of "Storyland: 2-XL & the Time Machine," but it's not-- it's a whole new program. Based on its low Assortment number and the fact that it's dated 1978, I have to guess that it was a very early tape that had a very small production run before being discontinued. If that's the case, this may be one of the most rare 2-XL tapes ever. 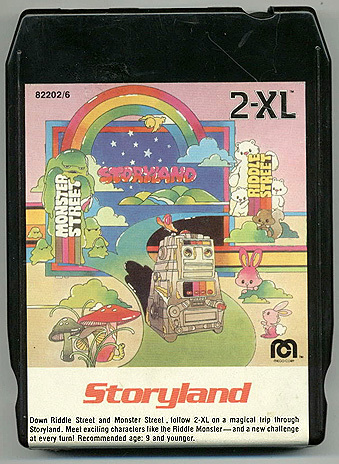 Second, it makes "Storyland: 2-XL & the Time Machine" now the second tape in a Storyland series, just like the Games & Puzzles, Sports, Science Fiction and other two-tape series that were made in 1978. Third, this is the only 2-XL tape (to my memory) to actually include 2-XL on the tape artwork! As to the program itself: It's aimed at ages 9 and younger, so it's not quite on the level of "2-XL and the Time Machine." (Yet despite that, every challenge 2-XL faces is presented as life-threatening. Not too bad for older kids, but it could be quite scary for younger ones.) The basic premise is that 2-XL receives a magic hat which takes him to another world, where he encounters all kinds of strange creatures, and each one presents him with another challenge that he (and you of course as his Partner At Home) must pass to move on. And while all roads lead to Rome eventually (as is kind of unavoidable with the 8-track format), it has enough variations and even a few fake-outs that make it worth playing at least two or three times. * A NOTE ABOUT PRINTING CARDS OR BOOKLETS: I'm attempting to make these files in the original sizes. Unfortunately computers are odd beasts, and something that looks the correct size doesn't always print at the correct size. If it doesn't print correctly for you, your best bet is to save the file and open it through an image program such as Adobe Photoshop and resize it there. I'll keep working on it as well to see what I can do to make sure they print correctly.